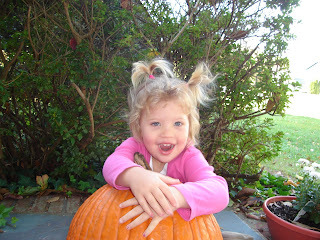 Here are the farm photos...just thought I should use a different post because there were so many Halloween photos! Today was a really busy and fun day. 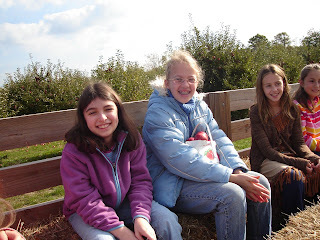 It began with a field trip with several homeschool friends to Woodside Farm, a local place that sells apples, cider, baked goods, honey, and cider donuts. 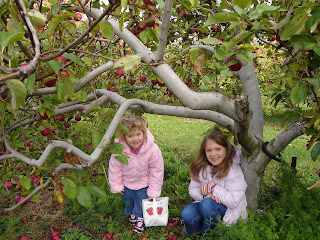 They have 15 acres of orchards, with 32 different types of apples. We toured the store and heard about the farm's history, types of apples, how orchards are run, and which types of apples Woodside chose to grow. He also told us about the natural pesticides they use--bat houses and purple martin houses were the ones the kids liked the best! We learned about honey and cider making, saw the cider press, learned that the man who owns the farm and his son can pick 20 bushels of apples in about an hour (!) and saw where they store the cider apples as well as the apples they'll sell. 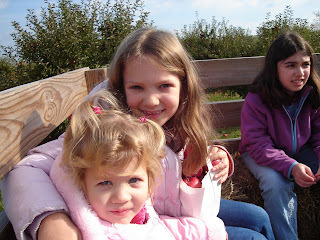 We got to go into the orchard and pick apples, and then we had a hayride around the orchard. Emma was scared to go at first (I think it was because there were no car seats and seat belts!) but once she saw that I was fine with her getting on and would sit right next to her, she happily crunched an apple while we rode. 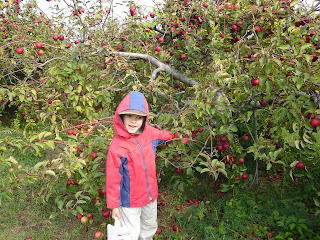 We picked the most beautiful, tiny, jewel-red apples I've ever seen. I can't remember the name of them! But they are small, like a clementine, and yet juicy and crisp, with gorgeous red skins, and they grow in clusters like cherries. We call them Emma sized apples. The afternoon was a blur of school work, lunch, and play time. 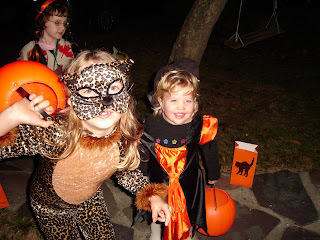 Then my friend Amie brought Evelyn over for trick-or-treating, and the kids FINALLY got to meet baby Sadie! They were ecstatic to see her, oohed and aahed appropriately, and then ran off to play. Amie took Sadie home so they could hide from the revelers, and her husband David came here. 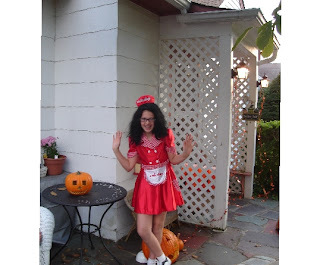 We all had dinner together, then Matt and David took the kids trick-or-treating while I did candy duty here. 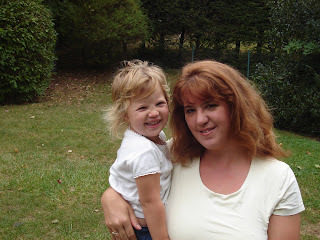 (This is the first year I've stayed back, because usually Amie, Jenn and I took the kids out and then men stayed home. But with Amie on newborn patrol and Jenn in NC--boohoo--I let Matt have a turn.) 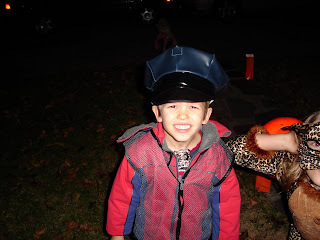 And Rachel wasn't with us for ANY of it--she went to her friends' house across the street, had a party and pizza for dinner, and went trick-or-treating with the big kids....my baby! Anyway, it was a lovely day...here are some photos. This afternoon, Emma was looking at books. All of a sudden, she got up and started rooting through the book baskets in the living room and her room. Obviously she was looking for something, so I asked her if I could help. She thought for a moment, then said thoughtfully, "Mama, can I order the 'Olivia' books from Santa at Christmas?" After I got my hysterical laughter under control, I explained that she could ask for the 'Olivia' books from Santa, but that it was a busy time of year for him and we couldn't make demands. She seemed satisfied with that. This afternoon Emma wanted a handful of chocolate chips. This is something I have tried to discourage--eating chocolate chips. Not because they aren't delicious, but because with 4 kids, if everyone gets in the habit of having a handful of chocolate chips when there's nothing sweet around the house, I go to bake something and have none left! So in order to distract her, I suggested baking instead. I thought the kids would want cupcakes--they love the individual size, gobs of frosting, and the fact that we generally put sprinkles on them doesn't hurt, either! To my surprise, however, they all agreed they wanted a big cake. Chocolate cake. Since they wanted my special chocolate picnic cake, that meant that there would be no buttercream frosting, though--it's such a moist cake that it's impossible to spread frosting on it. I usually choose whipped cream or chocolate ganache for it. Or ice cream, but we had none of that. Off to the kitchen we went. Time for the next surprise. Since Julia, Ben and Emma were all in on the decision making process, I thought I would have three kitchen helpers to make this cake. Aside: I love cooking with my kids, but having three of them "help" is really less help than you might think. Really, it's more of one long, drawn-out argument over who does this, who breaks eggs, who got to help more, etc. till I want to scream. But lucky me! Ben had already planned to go into the yard with his bow and arrows, and Julia was in the middle of making a pigeon comic. So only Emma was there to help. She is so sweet! So serious, standing on the step stool, peering into the bowl, talking about how delicious the cake would be. We did the dry ingredients first, and when I poured the oil, milk and coffee onto them, the cocoa changed color from getting wet. "Oh!" she cried, "The cocoa is turning black, Mom!" in this worried little voice. She took a deep sniff over the bowl and pronounced it perfect, and she got chocolate all over her little face, licking the beater. After it went into the oven, she asked about every three minutes when it would be done. I asked her if she'd heard the timer on the oven ring yet. She thought a minute, then said, "No! I guess that's supposed to mean it isn't done yet, then...."
I had coffee the other night with my friend Sue. It was nice to go out in the evening for no real reason--not to the library for school books, not to get groceries or someone's birthday gift or tape or dog food, not to exercise. But just to have pure social time. Basically I only do that with my book group, and that's just once a month or every 6 weeks. Anyway, we talked about a lot of things. Homeschooling was a huge. 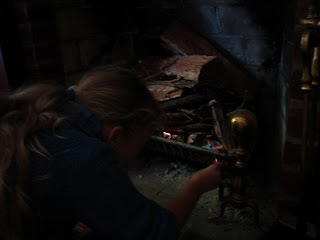 We are having the same kinds of frustrations with our kids around school work, although she only has two kids, and they are 13 and 10--so none of my frustrations around noise level and little ones needing or wanting something while I'm trying to help Rachel and Julia. Additionally, she moved here from Arizona--a place with no regulations in regards to homeschooling. So she had many questions, since New York is one of the most highly regulated states. Then we both discovered we love to write. We both dream of being published. We both have the problem of life completely getting in the way of writing. We both realize that we "waste" tons of time every day that could be spent on writing--watching TV, talking on the phone, reading magazines that really do nothing to improve our lives after they're done....we talked about writing techniques, and she told me of a series of books I should read on the subject. We agreed that we would try harder to write--maybe it won't happen every day, but to be mindful and try harder to do it. And to meet every few weeks for an evening of coffee, jotting notes and ideas, and critiquing the other's work. I think it will be a lot of fun, and who knows what could come out of it? OK, Matt tried the Japanese "cookies"--the ones that look like acorns minus their hats, and had the gross little dried fish packed with them. They are not cookies--he described them more like corn nuts, savory, not sweet. Imagine our surprise when we saw a box under our mailbox from our friends who are living in Okinawa! Yes, a package from Kelly, David and Collin (David is in the Air Force and doing a tour in Japan) was a real treat. What was in it? Stoneware soup spoons--once upon a time Matt and I had blue and white ones, but I don't know where they are. These are a jade green and very pretty. We'll have to make some soup. Origami--Kelly got packets of origami at a luncheon she went to and passed them along. Julia is especially fascinated--there are cranes and frogs that jump if you push down on the back (I've seen these but can't make them.) There are also cunning folded shirts, and rings that use two colors so the "stone" on top is a different color from the ring part. Food: here's the interesting part, because since everything is written in Japanese, you don't know what you're getting! There are chocolate cereal O's, which the kids of course love, pineapple buttery cookies (Kelly had told us about these, from a vineyard that makes pineapple wine...) which are also very nice. There is bread in a can--yes, a can. It's a raisin bread with citrus peel, and you pop it out of a can. I can't wait to try it; we haven't opened it yet, but Kelly had blogged about it a while back and I thought it sounded good. Then we have the unidentifiable round things. They look like acorns without the little hats--but inside the packets are tiny dried fish, with eyes and all! Kelly thinks they're cookies--but WHY would they pack them with fish? We fed a few of the fish to Molly and Bo, who loved them. We're working up to the cookie part! 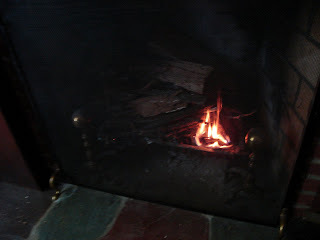 Well, today we had the first fire of the season! 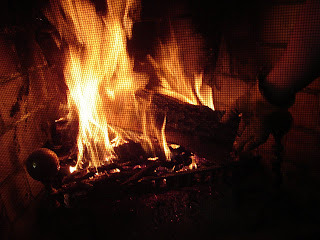 It was very pretty and cozy to curl up with a blanket and watch the flames burn bright! Here are some pictures to show you what it was like. To top it all off, we are having chicken noodle soup and home made bread for dinner. YUM! 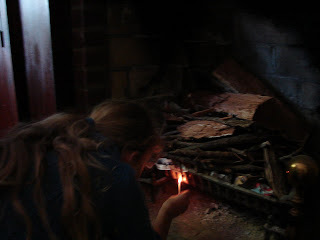 This is me, lighting the fire. This is the fire starting to burn. What was so funny to me was that at several tanks we looked in, Julia and Emma would pick their favorite creature and say that it was her pet now. Julia named this hideously ugly fish in the big shark tank Oscar, and he's her pet. Emma named one of the seahorses Katie, and that's her pet seahorse. Julia named the octopus Squiggly, and he's her pet. Emma found Nemo and Dory, which are, of course, her pets. This went on and on. I am waiting to see if they are still their pets the next time we return! I'm posting this photo Rachel took of me and Emma in the yard. Not very often is there a picture of me that I can stand! After dinner this evening I went for a long walk in lieu of a real workout. It was a great night, breezy and cool enough that I was doing a fast walk/slow jog to keep warm in my long sleeved T-shirt and pants. It was dark and quiet, leaves were skittering around, and it was nice and autumnal, which is a switch after the past week of heat and humidity. Anyway, I was gone about an hour, and when I got home, Emma was tired and kind of loopy--ready to go to sleep, in other words. It was just before 8:00, which is perfect, and I was anticipating doing some email and watching "Desperate Housewives" on the DVR. In all the excitement over Sadie's birth (our friend Amie's baby) I forgot to post about putting up the Halloween decorations, which we did on Monday--October 1. Obviously Christmas has fun decorations, but I think we love Halloween almost as much. The kids were busy when I got up that morning, busily drawing jack-o-lanterns and black cats to hang in the front window. They look nice, tiny and grouped together. In the front yard, we hung our ghosts in the trees--one is a ghost, the other three are ghost bodies with wooden cat, witch and Frankenstein heads. The scarecrow on a stake we put near the driveway--and every time I pass the front window I mistake it for a small child! 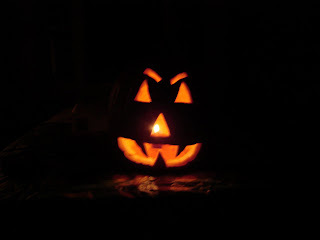 The plastic jack-o-lantern (no rotting!) is on the table on the patio, the Trick or Treat wooden hanging on the front door and the scarecrow harvest wreath on the back door. We hung sparkly pumpkin bunting on the porch light posts, and wound a strand down the stair rails on each side, too. We have a stuffed witch and scarecrow on our arbor benches, taffeta ghosts on sticks by the front walk, a sproingy metal ghost by the stair railing, and a metal shovel that's painted with a haunted mansion and a wooden sign also decorated with witches etc. by the magnolia tree. Inside the house we have many and sundry Halloween candle holders, a felt table runner with spiders, webs and ghosts on the sideboard, glass pumpkin cookie jar, Halloween cups to drink from, the witch candy dish, and of course my Halloween tote bag I made last year. Did I mention we love Halloween?